If you live in the woods like I do, you pretty much spend the summer gritting your teeth and hoping for the best when it comes to wildfires. It seems like every year gets worse here in the west and there’s no sign of it getting any better down the line. Although the thought of losing everything is horrific, we have to remember there are benefits to wildfires. Wildfires have always been an important part of the forest ecosystem and always will be. 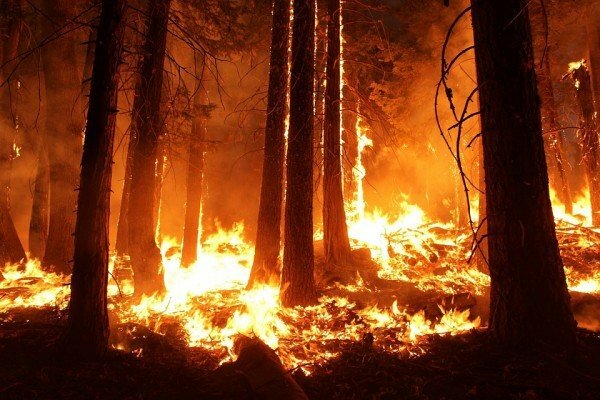 Fire clears the forest floor of dead vegetation and allows seedlings more access to sunlight and water, hence allowing for a new generation of forest to spring up. The intense heat of these fires create nutrients which restore the delicate fertility of the soil. Think of good garden compost. Wildfires also kill the diseases and insects that kill trees. If you’ve ever walked around in an old-growth forest or one that hasn’t burned for awhile, you’ll notice a couple of things. First, there’s a ton of debris laying around and the duff (the floor layer) is incredibly thick and spongy. Sometimes you have to dig over a foot down to find any soil. Secondly, you’ll notice the lack of new foliage around. That also means a lack of food and habitat for deer and other critters. If you’ve ever walked through an area that’s been burned in the last half-century, the first thing you’ll notice is an abundance of new growth including wildflowers and various plants. There’s a plant called fireweed that can only grow after a fire. Not only is it beautiful, but it’s an essential part of restoring vegetation which in turn establishes a more abundant habitat for wildlife. I grew up on the National Forest in North Lake Tahoe and I clearly remember how incredibly beautiful the forest was. Since then, they’ve managed to thin it down to almost nothing. While the homes are better protected from wildfires (people have a lot of money around there), it isn’t even close to what it used to be and that makes me sad. You have to walk quite a way up the mountain before you see what we used to see from our back yard. But the real issue (according to many experts) is that our planet is getting warmer. Recent drought conditions and extremely warm weather have stressed trees leaving them dry and prone to beetle infestation. What we now have is a tinderbox waiting to ignite and we’re pretty much at the mercy of the spark. The question we need to ask ourselves is if we are willing to accept the risk of living in the woods. I think the answer is pretty much unanimous for most of us.